Somewhere in China I figure a factory is doing quite well out of this mechanical pencil. Here’s three branded versions of it. All have slight variations in colour scheme, branding and packaging. 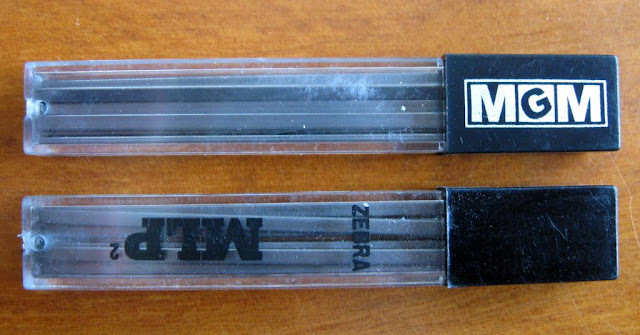 I have previously mentioned one of them, the MGM mechanical pencil. 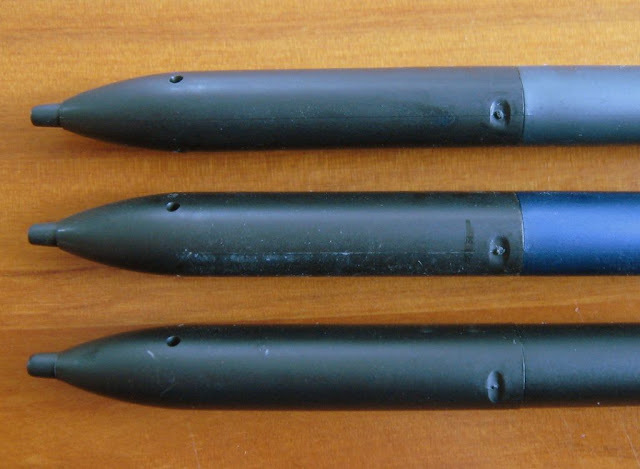 A cursory look indicates they are all the same mechanical pencil, and closer examination confirms it, e.g. these moulding marks. 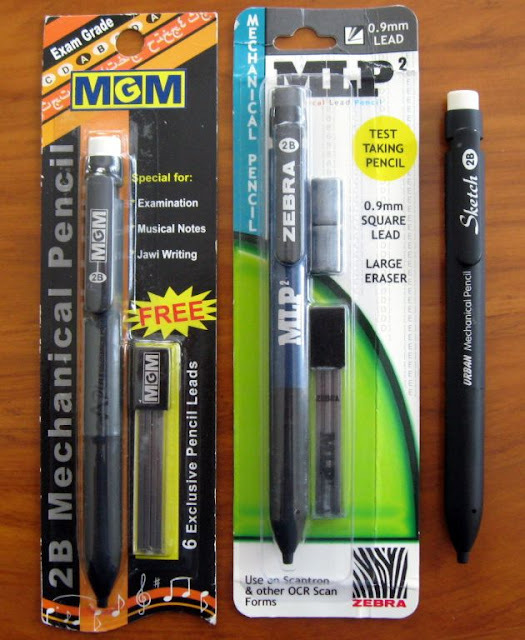 MGM of Malaysia call it the A-200 Plus mechanical pencil, Zebra of Japan call it the MLP2 mechanical pencil, and Urban and Recipe of South Korea call it the Sketch mechanical pencil. All label it as “Made in China”. All label it as being filled with 2B lead. Zebra incorrectly state it is 0.9mm square lead. Others not depicted here call it 1.85mm lead. There seems to be a bit of variation but basically the lead is rectangular about 1.8 to 1.9mm x 0.95 to 0.98mm. Not surprisingly you can see the Zebra and MGM lead refill containers clearly originated in the same factory too. 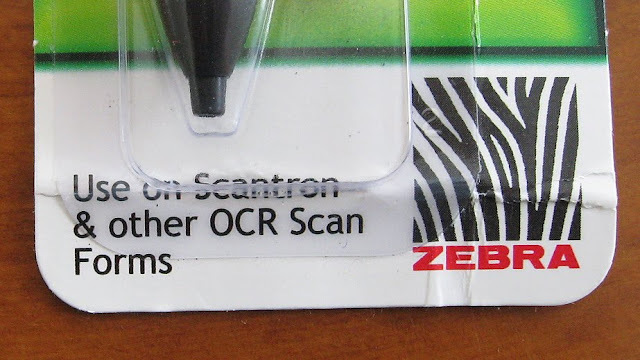 MGM and Zebra advertise it as, amongst other uses, an examination or test taking pencil, with Zebra going so far as to categorically state ‘Use on Scantron and other OCR Scan Forms’. Yea, just what we need, lets fire up that old nonsense ‘Must use number 2 wooden pencil’ drama. Hmmm, 2B, that should be a number 4 pencil? And it’s not wooden either. How dare they claim it's good for Scantron! Oh, hey wait, 2B has a got 2 in it so it must be a number 2 pencil too. Phew, that's OK then! If I had to choose one for myself, then I like the styling of Urban and Recipe from South Korea. 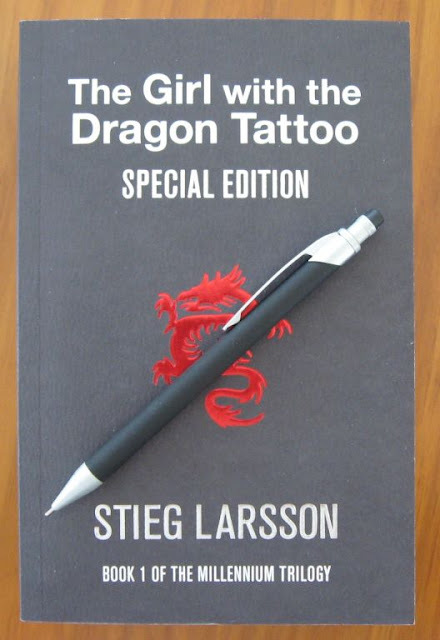 A pencil fit for the modern urban warrior, fighting his way through the megacity of Seoul? I was recently browsing the pen aisle at a local office supplies store and noticed something new - the Faber-Castell Eraser Pen, article 183998 in its blister pack form. 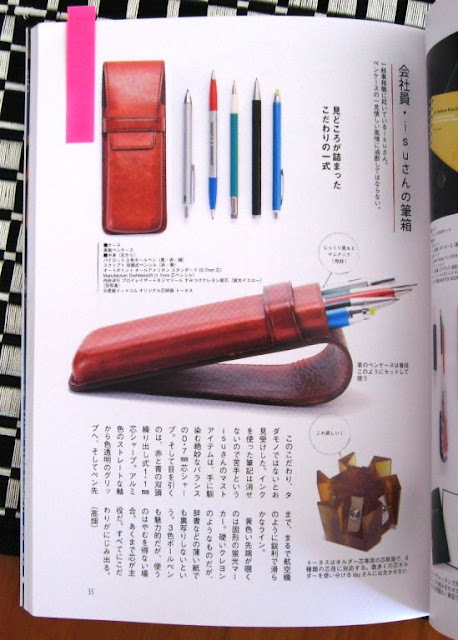 Look at the pocket clip, the grip…it’s classic Faber-Castell styling. Since it was on special, and I have a bit of an interest in stick erasers I decided to hand over the necessary coins and become the owner of one. 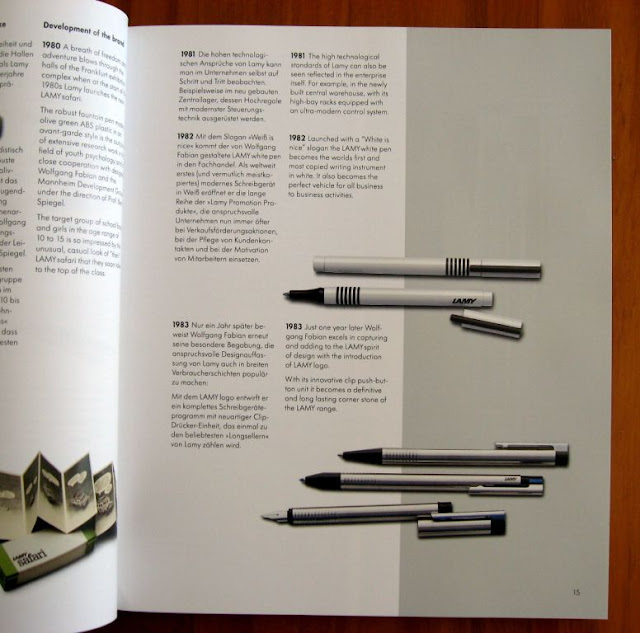 As noted above, the visual styling is classic Faber-Castell and I find it quite appealing. The grip is hard plastic and despite the grooved rings is somewhat slippery, but you usually only hold a stick eraser for a few seconds at a time so that’s not a major concern. 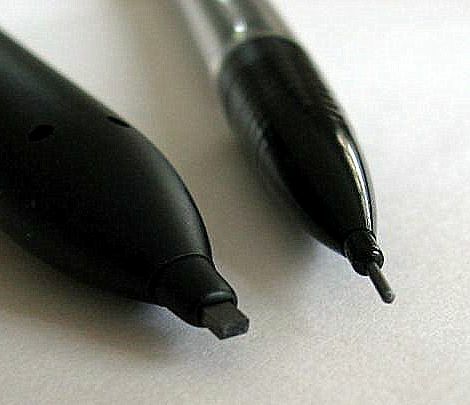 The Faber-Castell Eraser Pen has two uncommon features. First, you extend and retract the eraser core by twisting the tip. No push top button or slider mechanism like many other stick erasers. This does have an advantage in that unlike some stick erasers the core doesn’t push back inside the body under heavy hand pressure. 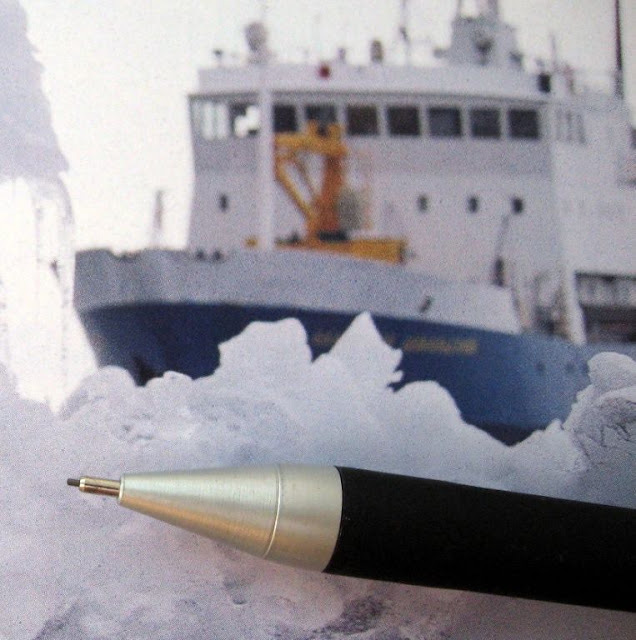 The second unusual feature is that the eraser core is only short, about 29mm (1 and 1/8th inches) long, and three spare eraser cores are stored inside the body. You unscrew the body to get to the replacement cores, and then feed them in through the front of the tip. Well, that’s the first negative point in my book. You can twist out about 20 mm of the eraser core, the last 9mm being gripped inside the mechanism. So, that’s about 30% wastage of your eraser. The 9mm wastage might be similar to many other stick erasers, but they usually have cores that extend their full length, not a measly 29mm. Still, I imagine this wastage is good for replacement eraser core sales, if you can find them for sale anywhere. The eraser core is about 6.5mm (1/4”) diameter. 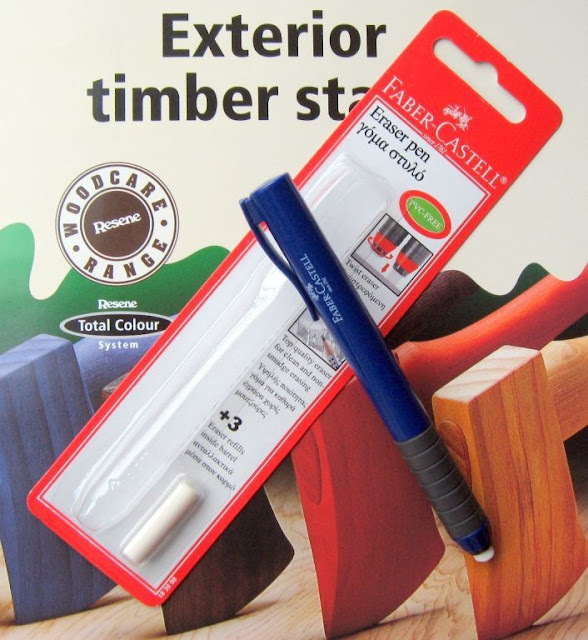 The packaging does not say anything about the composition of the eraser core, but it appears to be a plastic rather than a natural rubber compound. The packaging does state “Made in China”. Right then, let’s put the Faber-Castell Eraser Pen up against my test bench standard, the Staedtler Mars Plastic. The first thing I noticed is that the Faber-Castell eraser is hard and abrasive. It feels it, and it sounds it - completely different to Mars Plastic, and not in a good way. 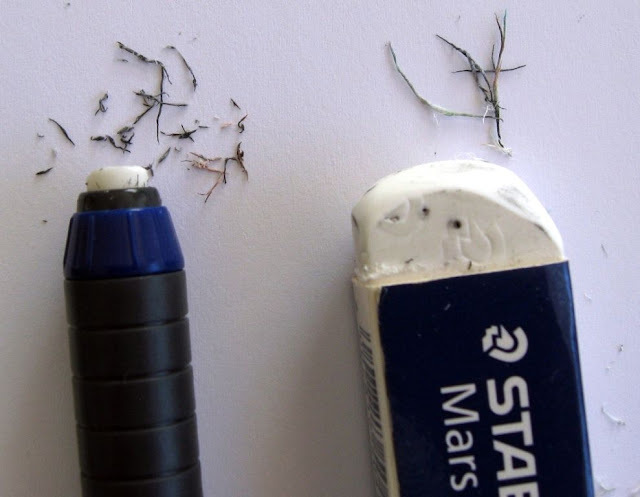 The eraser waste is somewhat crumbly compared to Mars Plastic – it doesn’t twist up easily into long strands. Here is a test card of the two erasers attempting to erase various woodcase and mechanical pencil leads. 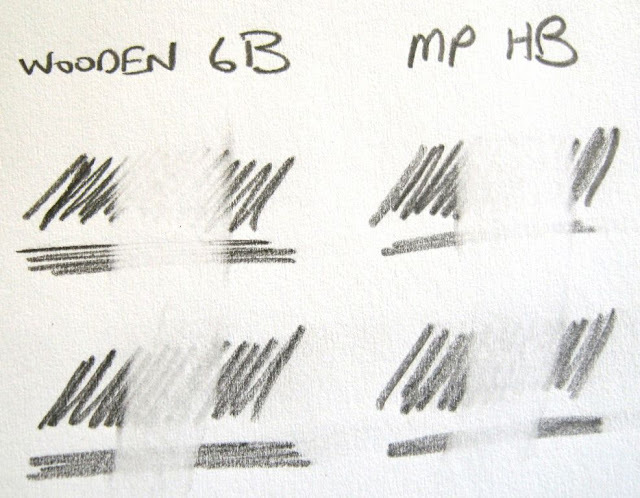 For wooden coloured pencil and wooden pencil HB lead Staedtler Mars Plastic was slightly but clearly better. 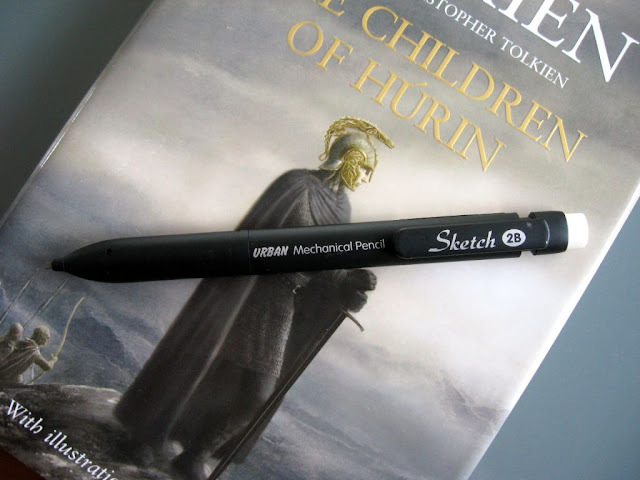 For wooden pencil 6B and mechanical pencil HB lead Mars Plastic was significantly better. 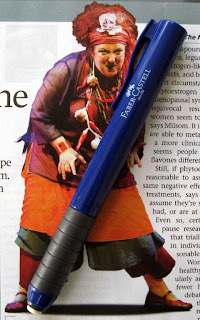 So then, no matter what the price, in my opinion this eraser pen detracts from the Counts considerable reputation and I don't understand why Faber-Castell would apply their brand and signature styling to a product like this. Now here’s a rather unusual sight on the packaging of a mechanical pencil. Well, my apologies to those of you from Nordic climes, because that may not be an unusual sight for you, but I’m going to go out on a limb here and say I’m pretty sure it is for the rest of us. So then, the packaging in front view. 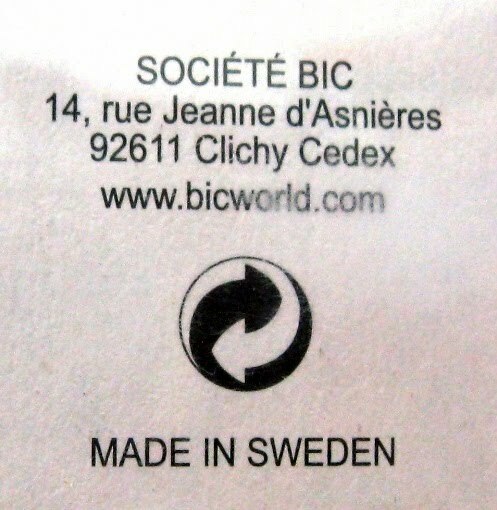 Made in Sweden eh? Well obviously Ballograf springs to mind. Founded in 1945, Ballograf was bought by BIC in 1959, but then in 2004 was purchased from BIC by the GM of Ballograf and a partner. The Ballograf website states they make over 4 million pens and pencils per annum with a staff of thirty. Great stuff. It’s good to see small regional manufacturers still thriving in the face of the international juggernauts, and being competitive enough to supply a company like BIC. 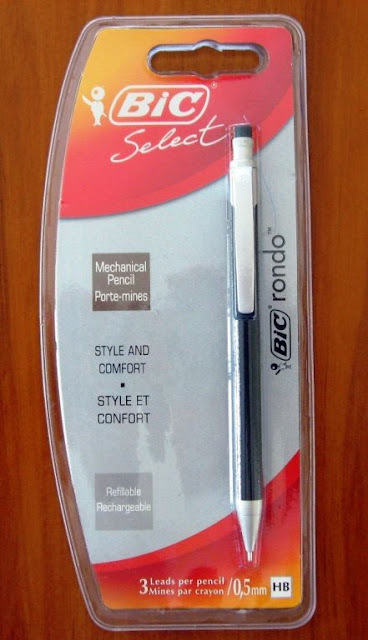 You will see this pencil on the web as the BIC Rondo, but also as the BIC Ballograf Rondo mechanical pencil and Ballograf Rondo mechanical pencil. Actually on the Ballograf website there is a Rondo and a Rondo Plus. 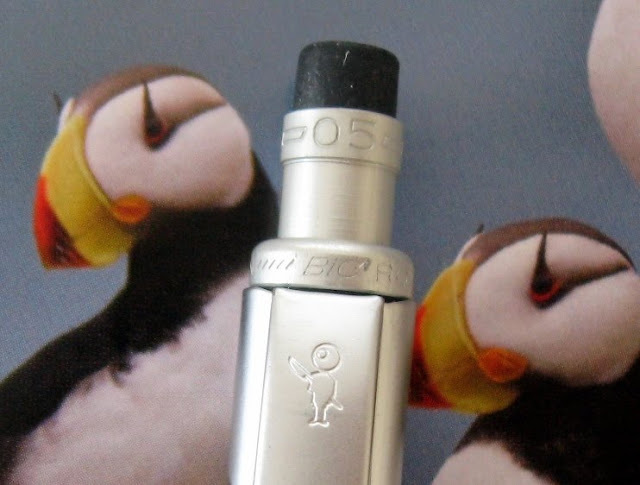 The difference between these two appears to be that the Rondo has bright nickel plating whilst the Rondo plus has frosty chromium plating, so I think that means my BIC Rondo is actually a Rondo Plus. 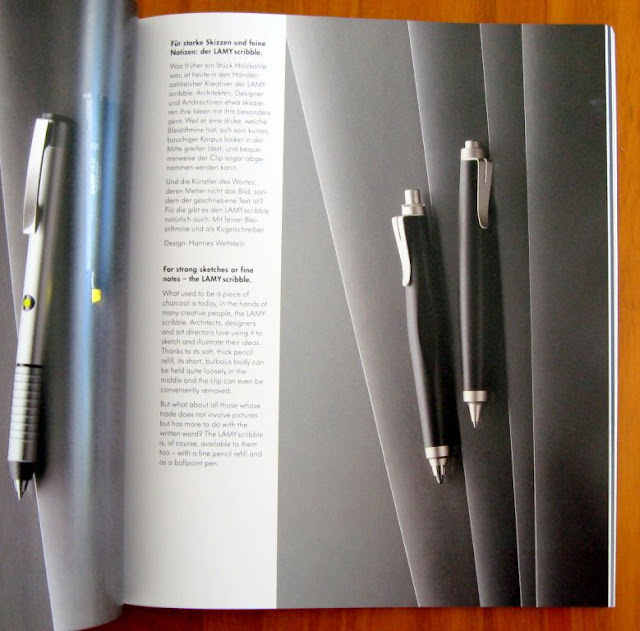 Plain rubberised body – rather reminiscent of the TUL mechanical pencil. 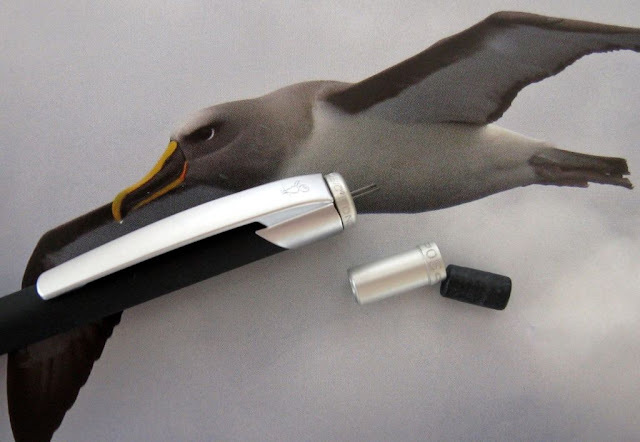 From side on the pocket clip is quite stylish. The black eraser also looks good. The lead sleeve is a fixed metal pipe. It is unusually thick for a pipe sleeve, but I guess that makes it slightly less stabby and considerably more resistant to damage if the pencil is accidentally dropped onto a hard floor. Mine is 0.5mm lead but 0.7mm is also available. The lead advance mechanism is a standard push top ratchet. The eraser is removable, and lead refills are fed in through the top as usual. 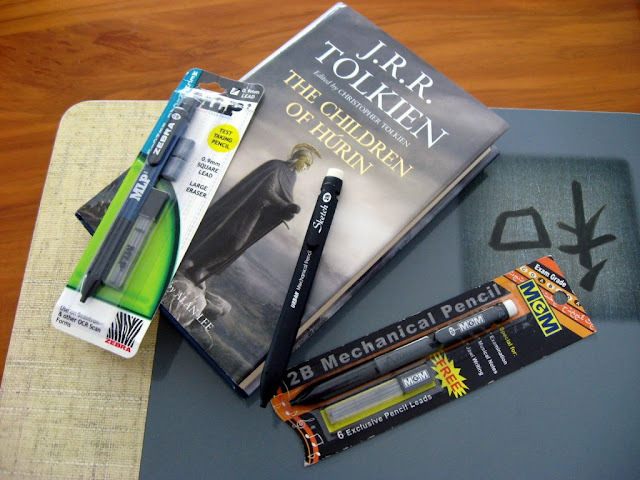 This BIC Rondo mechanical pencil was supplied to me by Euroffice, an office supplies specialist in the UK, in exchange for putting it on this blog and an acknowledgement. Well 2010 is upon us so I thought I should announce The Plan. I know it’s crazy talk, but there are other things besides mechanical pencils, so this year my master plan is to publish one blog post per week. Posts will tend to alternate between something significant like a proper review and something lighter and less laborious. We will see how well The Plan is implemented. Now for a few other things. 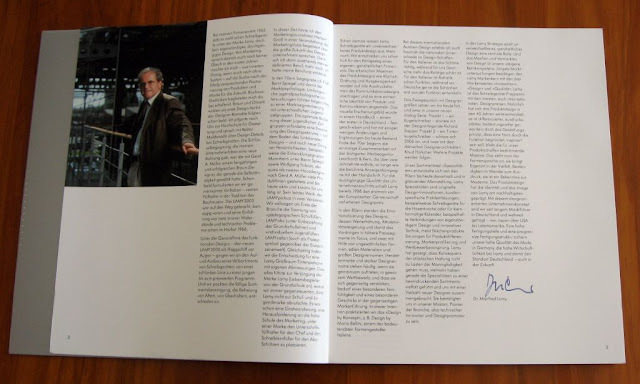 Firstly, in the news it is reported that Porsche Design have ceased their contract with Faber-Castell, and Pelikan will take over manufacturing their products. 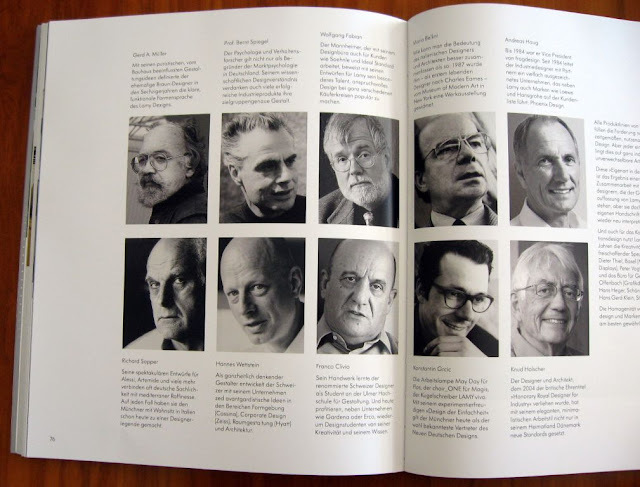 Secondly, Palimpsest, a blog you might want to browse, primarily focusing on the relationship between various historical figures and their writing instrument of choice. Lastly, I have recently been disturbed by Google Webmaster Tools telling me my blog is way way way down low in the page loading speed rankings. I make it into the slowest 10% of pages on the net, though apparently that’s not exactly unusual for blogs. I have always paid some attention to my blog loading speed because for the first few years of this blog I was on dial-up. So, I’d like to get your opinion on my page load speed, in comparison to other blogs, hence the Poll over in the sidebar. Speed! In comparison to other blogs this blogs pages load - Fast, Average or Slow? 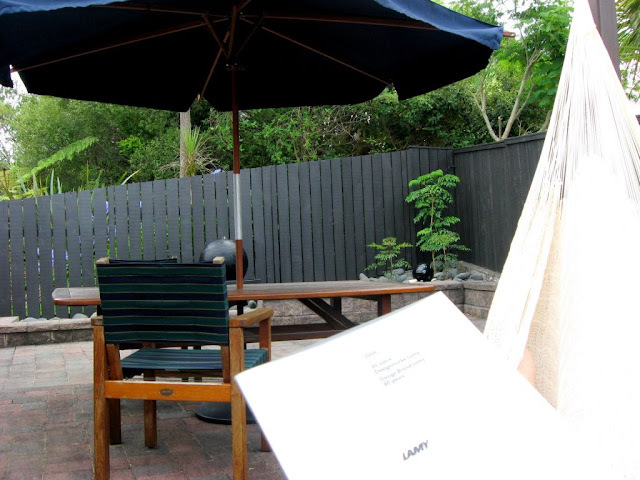 Update - 16 January - Thanks for your comments and poll votes about page speed. I've ended the poll as the results are clear. Total 56 votes, with Fast = 50%, Average = 46% and Slow = 4%. So, as I suspected, I don't have much to worry about re page speed despite what GWT says. 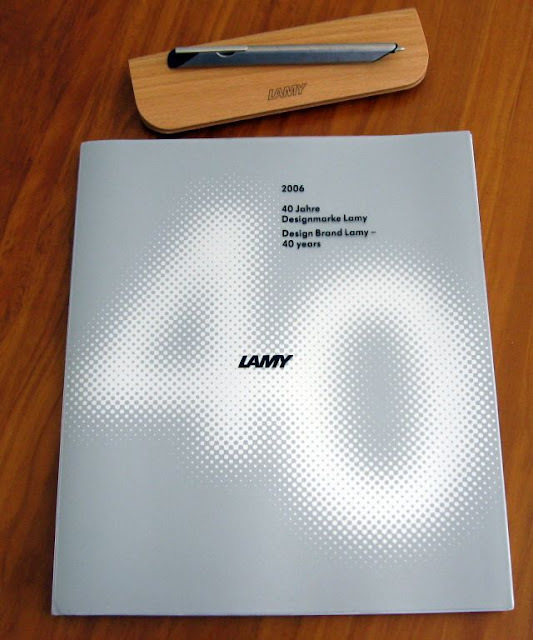 Entitled “2006 Design Brand Lamy – 40 years” this 27 x 23 cm (10 ½ x 9 in) softcovered 88 page booklet celebrates 40 years of Lamy as a design lead company and the 40th Anniversary of the Lamy 2000. 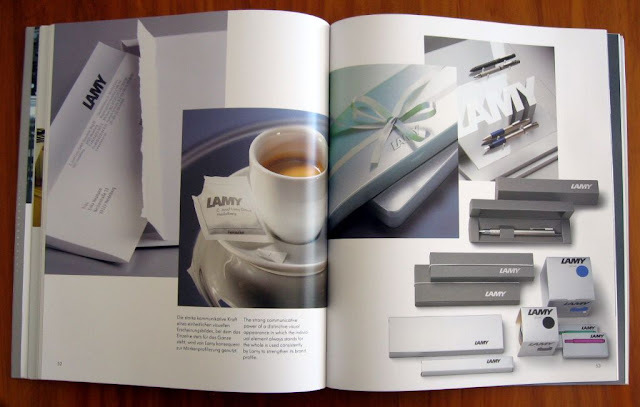 The introduction by Dr Manfred Lamy explains that he joined the company in 1962 and whilst Lamy was a brandname there was no consistency of distinctive design. 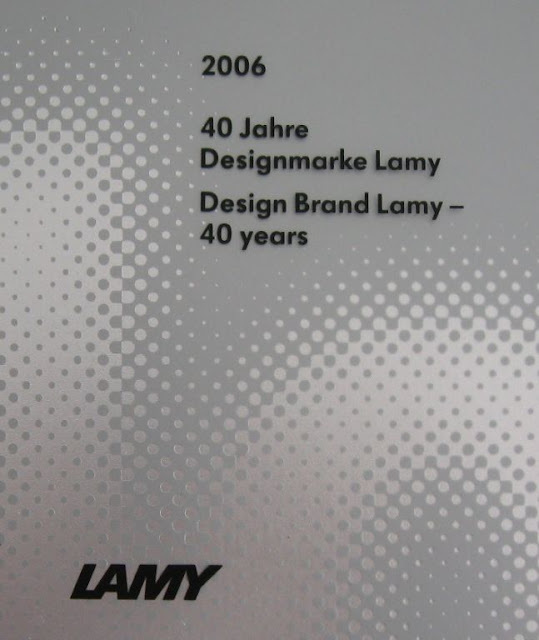 Dr Lamy then began the journey to establish Lamy as a design and marketing brand which led to the project to design “a fountain pen in the tradition of the Bauhaus” and thus the Lamy 2000 was born in ’66. 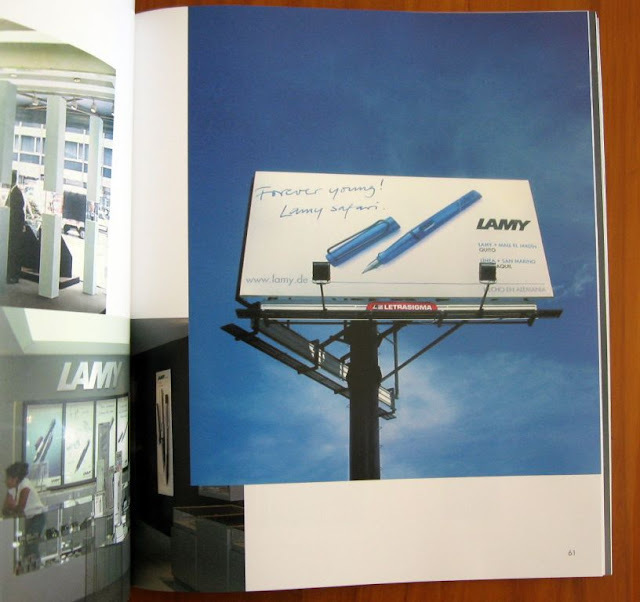 One of the little gems from the book that I like the most is Dr Lamy discussing design creativity, “…for Italians beauty is right, while for us Germans what’s right is beautiful.” Another statement that resonated with me is “…the making and marketing of design products is our fundamental core expertise.” Many claim this sort of thing but personally I think it’s true in relation to Lamy. 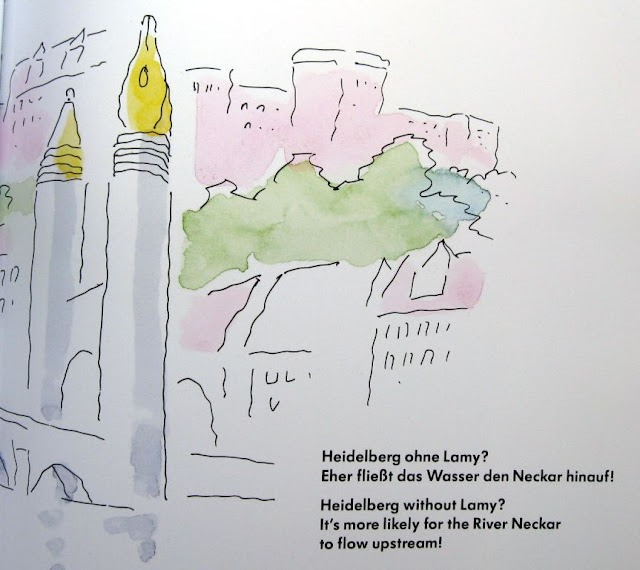 The book is bi-lingual, with everything being in both German and English. It is divided into 4 major sections - The History, The Product Design, The Brand and The People. See, it’s in Japanese, which I don’t read or speak, so I just get to look at the pictures. 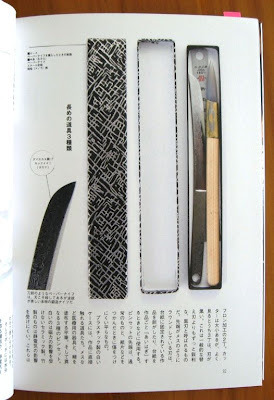 Of course being a Japanese book, it opens back-to-front by my western standards. 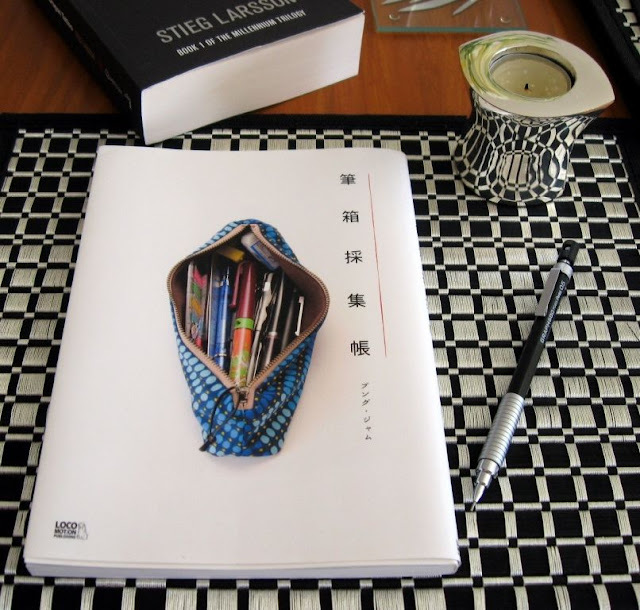 It was sent to me from Japan by Isu of The Uncomfortable Chair, and he explains, “The book, 筆箱採集帳(fudebako-saisyucho), is a collection book of pencil cases. 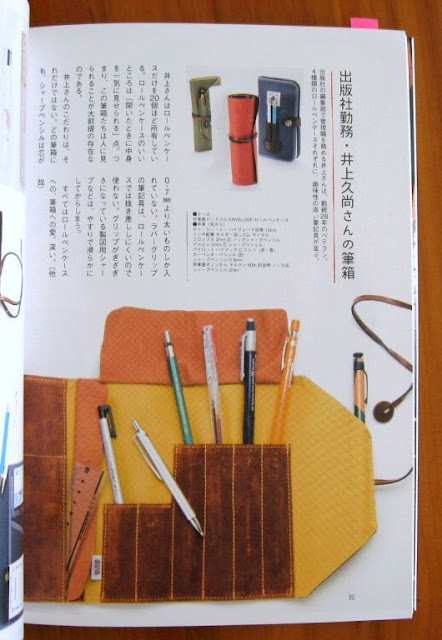 "Fudebako" means a pencil case, "saisyu" means collection, and "cho" means note or book”. So basically in English its title would be something like “A Collection of Pencil Cases”. 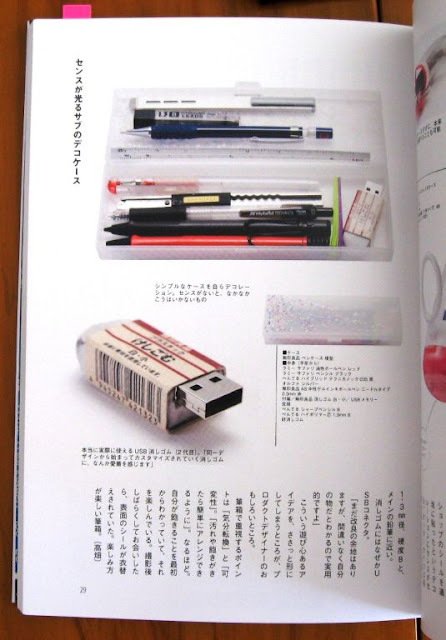 The book is the creation of “Bungu Jam”, a group of three well known Japanese stationery enthusiasts. 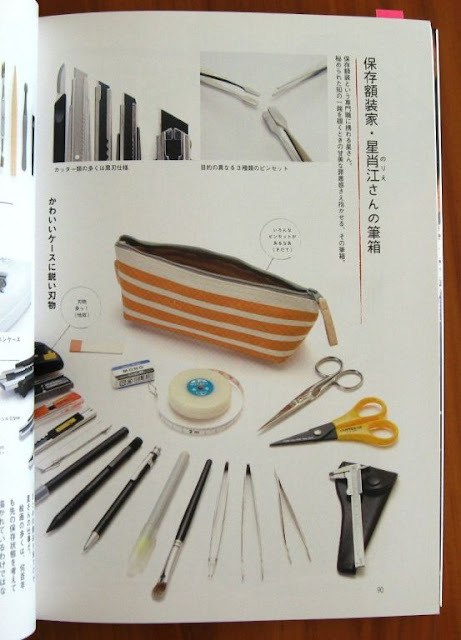 Somehow they selected 59 people and photographed the contents of their pencil cases. The people are from various different walks of life – the pencil cases featured are carried by architects, illustrators, designers, writers, students, teachers, doctors, actors, tour leaders, and more. Softcover, A5 size, 95 numbered pages - here’s a random selection of some the pencil cases. 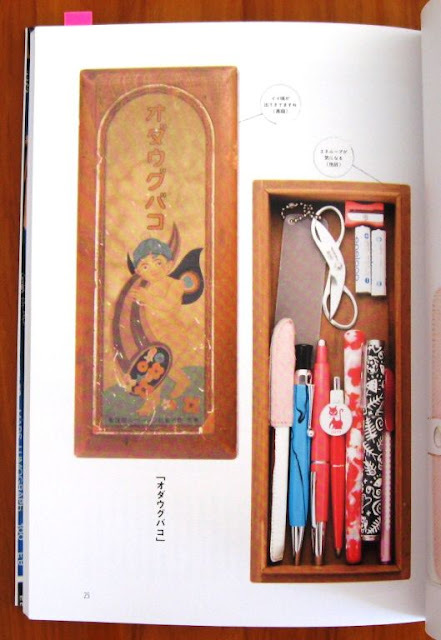 Note that this page is the pencil case of a person called “Isu”. One of my favourites – artistry in fine steel. I’m hoping the photos will be viewed in a favourable light rather than in a possible breach of copyright sort of way.